Guy Burgess and the Cambridge spy ring. From the BBC archives, documents pertaining to the BBC career of Cambridge spy ring member Guy Burgess, including a letter from Burgess to Anthony Blunt and Burgess's memo about a conversation he had with Winston Churchill. From this month's Edinburgh Book Festival: An interview with Kate Summerscale, author of The Suspicions of Mr. Whicher, which focuses on the Constance Kent case. Go here for the audio. Happy birthday, Lady Antonia Fraser. Lady Antonia Fraser, writer of historical nonfiction (The Gunpowder Plot, Mary Queen of Scots, The Warrior Queens, etc.) as well as the creator of reporter-sleuth Jemima Shore, was born today in London in 1932. Jemima debuted in Quiet as a Nun (1977), followed by several more books and a TV series. Alas, we have not seen Jemima since Tartan Tragedy (2006). James tops Greene in Bloomsbury auction. Leslie Charteris's Meet the Tiger and Conan Doyle's The Hound of the Baskervilles went unsold. Underappreciated novels: Izzi, Gruber, et al. This week on BBC Radio 7, Gladys Mitchell's Golden Age sleuth Mrs. Bradley appears in The Mystery of a Butcher's Shop (1929), and John Harvey's Inspector Resnick appears in Wasted Years (1993). Go here for the schedule or to listen. 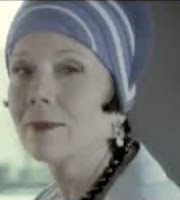 About the image: Diana Rigg as Gladys Mitchell's Mrs. Bradley, The Mrs. Bradley Mysteries, Mystery! C-Span talks to Bruce Chadwick, whose new book I Am Murdered: George Wythe, Thomas Jefferson, and the Killing that Shocked a New Nation discusses the slaying of Judge George Wythe, a Virginia signer of the Declaration of Independence—and that Wythe knew that he had been poisoned. The University of California Press blog looks at Alcatraz, which marks its 75th year in 2009. Fergus Hume's The Mystery of a Hansom Cab on ABC's Book Show. In its series on Australian classics, the Australian Broadcasting Co.'s Book Show looks at The Mystery of a Hansom Cab (1886) by British-born Fergusson Wright Hume, which, according to Christopher Pittard's Clues 26.1 article, was the sensation of 1887 London—selling more than 30,000 copies in under 6 months. Guests on the program include Clues editorial board member Stephen Knight (Cardiff University) and University of Melbourne's Lucy Sussex, who wrote on Edward Bulwer Lytton in Clues 26.1. Steve Hockensmith, creator of Western brothers Otto and Gustav Amlingmeyer who believe that they can give that "deducifyin'" Mr. Holmes a run for his money, turns 41 today. The latest work in his series is The Crack in the Lens. Judy Woodruff likes Daniel Silva. PBS's Judy Woodruff reports that Daniel Silva's The Defector is on her summer reading list, but also confesses to bias: She previously worked with him at CNN. BTW, I'm home from surgery and doing okay. A short hiatus for The Bunburyist. I'm having surgery this week, so The Bunburyist must take a short vacation. Hope to be back in form sometime next week. Neglected Books looks at Elliott Chaze's Wettermark (1969). The Neglected Books blog discusses Wettermark (1969) by journalist Elliott Chaze (1915–90), mentioning the admiration of Bill Pronzini and Ed Gorman for this exploration of an impending bank heist. Ed has mentioned with particular favor Chaze's Black Wings Has My Angel (1953), now back in print. Richard Matheson's "Duel," in which a trucker terrorizes a motorist, is featured this week on BBC Radio 7. Go here for the schedule or to listen. About the image: Dennis Weaver doesn't like what he sees in the rearview mirror in Duel (dir. Steven Spielberg, 1971). Obit Magazine notes that today marks the death of Shirley Jackson at age 48 in 1965. Best known for "The Lottery" (1948), The Haunting of Hill House (1959), and We Have Always Lived in the Castle (1962), Jackson, in Jonathan Lethem's words, "wrote about the mundane evils hidden in everyday life." She received a posthumous Edgar Award for her short story "The Possibility of Evil." Faber Finds has reprinted several of ex-journalist Colin Watson's rollicking mysteries—Coffin, Scarcely Used (1958); Bump in the Night (1960); the Silver Dagger-winning Hopjoy Was Here (1962) and Lonelyheart 4122 (1967); Charity Ends at Home (1968); The Flaxborough Crab (1969); and Broomsticks over Flaxborough (1972)—as well as his critical work on British mysteries, Snobbery with Violence (1971). But last year Colorado-based Rue Morgue Press beat FF to the Watsonfest with its more inexpensive editions of Coffin, Scarcely Used and Bump in the Night. About the images: British publisher Faber and US publisher Rue Morgue Press go mano a mano with dueling editions of Colin Watson. My 2 minutes of fame. 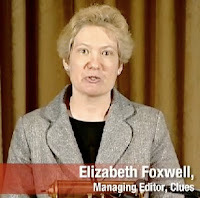 I was a bit startled to see that, uploaded on the Library of Congress's YouTube Channel, is the Center for the Book presentation by Sara Paretsky that coincided with the winter 2007 Clues theme issue on her work. Yours truly shows up at the end. Michael Bond this week on BBC Radio 7. Monsieur Pamplemousse, the hapless sleuth-Guide Michelin critic of Paddington creator Michael Bond who is ably assisted by his dog Pommes Frites, is featured this week on BBC Radio 7 in "Monsieur Pamplemousse Investigates." Go here for the schedule or to listen. Edinburgh Book Festival: Kate Summerscale. Geezer alert: The Beloit College Mindset List. US steals march on British with Colin Watson.